If you love the water and kayaking is one of your favorite pastimes, then you need to get one for yourself. However, searching for the best kayak for you can be a challenging task. Usually, kayaks come in different sizes, shapes, and colors. You also need to consider a number of factors before you decide to purchase a kayak. Kayak fishing has been around for thousands of years ago. Through time, these improved and you can now find kayaks that are made from better materials and designs. To spare you the hassle of going through hundreds of options, here are the top 10 best fishing kayak under $1000. Advanced Elements is the most trusted names when it comes to the best fishing kayak under 1000$. This is made with built-in aluminum ribs that effectively defines the stern and the bow and also improves tracking. It comes with three layers of materials for protection against extreme puncture. This is pre-assembled in the factory so you just unfold, inflate, and attach the seats. As simple as that! This kayak is specifically designed for high support with its adjustable padded seats for long hours of paddling. There are also three seat locations that will allow you to go solo or tandem. Advanced Elements Advancedframe Convertible Inflatable Kayak is designed for the best in performance. You can inflate and deflate it anytime to make it easier to store. This is perfect for solo riders, but since it can be converted for two riders, you can bring someone along with you, or even bring your dog while you enjoy the view. These are proven to handle difficult waves and will not overturn. 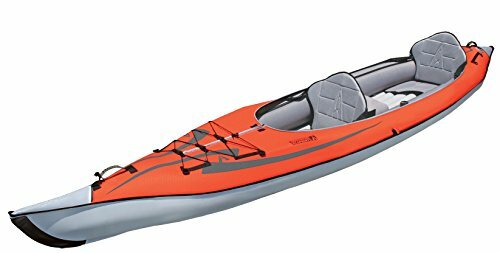 This is a 13-foot 74 lbs fishing kayak where one person sits on the top fishing kayak and one of the best fishing kayaks under $1000. This has a dual position hero seat and if you are looking for speed and stability, this is your best choice. It also includes a 2-flush mount rod holders and four get tracks for a customized rigging. This kayak has a built-in, pre-installed toe-controlled rudder system that can save your energy during long paddles when it’s too windy and when you are facing strong currents. The Vibe Sea Ghost 130 also comes with a fishfinder transducer port with mounting points and a protective lid. Storage is not a problem with its large center console, a 20” front oval hatch, a rear hatch, and also a large bungee rear tank well. This is a 12-foot 70-lbs tandem kayak where 3 people can sit on top. This is one of the best fishing kayak under $1000 and is the best choice for fishing, traveling, or if you just want to have fun in the water. It can carry a maximum weight of 440 lbs capacity. This tandem kayak has 6-rod holders that consist of 4 flush-mount kayak fishing rod holders and 2 adjustable rod holders to keep your fishing lines in the water. Storage areas are amazing with its dual watertight storage compartments if you want to store smaller items and also a cargo area with a bungee tie-down straps for your larger gears. The paddle rests have paddle parks that hold the paddles securely in place when you are not using them. This is to prevent you from losing them while overboard. This Brooklyn Kayak Company UH kayak has four carrying handles making it easy to transport in and out of the water. This Brooklyn Kayak Company UH is adventure-ready. This is one of the best tandem kayaks in the market perfect for fishing adventures. You can paddle is across the bay, or visit the lake or the lazy river. This kayak has the stability to keep you balanced even when faced with strong winds. Aside from the amazing features that come with this kayak, Brooklyn Kayak Company also offers a 5-year warranty for your purchase. This is one of the original and the best fishing kayak under $1000 that are specifically designed for fishing. The hull performance is very fast and stable. It is very quiet and very easy to handle in either calm or rough waters. Its large front hatch making it easy to access the bow to stern internal storage. It can also accommodate multiple rods and a safe deck storage. This fishing kayak comes with amazing features like its 2 paddle keeps 2-rod holders, a 6” hatch with a storage bucket, and also a 2-cup holder. It is compatible with a transducer and a skid plate. Its oversized rear tank is perfect to easily store coolers, crates, tackle boxes, and even bait wells and scuba tanks. Ocean Kayak Prowler is one of the best fishing kayak under $1000. This is the perfect kayak if you want to jump to the senior level. You can bring everything that you need because of its amazing storage spaces. Overall, this fishing kayak has received numerous positive reviews when you want to bring it for fishing activities. This is a 9-foot 46-pound one-person sit on top fishing kayak. It is made with deluxe kayak seat that effectively provides portability and stability in such a small package. This comes with a 6-capped flush mount for your rod holders, and a mounting point for Scotty, RAM and Vibe mount accessories. With Vibe Kayaks Skipjack 90, there’s no more need for overboard paddles. It has a built-in two paddle parks to make sure that your paddles are secure and safe when you are not using them. It also has outstanding storage option. This has four sealed hatches with bag inserts, and also a large bungee rear tank well when you need to protect your kayaking necessities. What makes this the best fishing kayak under $1000 are its 6-grip carry handles that makes it easy for you to transport it anywhere. The Vibe Kayaks Skipjack 90 Sit On Top Fishing Kayak has great maneuverability and stability which cannot always find on small kayaks. It is very easy to handle and can fit even the back of your SUV. This kayak also comes with a lifetime manufacturer’s warranty for any defects and a one year for parts that came with the kayak. This 13.5-foot tandem kayak is one of the best fishing kayak under $1000 that can accommodate up to 3 people. It is made with comfort in mind because of its deluxe adjustable seats complete with back supports. The storage compartments are impressive. It has 3 safely covered storage that you can use for your kayaking necessities. This tandem kayak comes with paddle holders, adjustable foot braces, it is self-bailing, conveniently located carry handles. This Sun Dolphin Bali is known for its versatility. Because it is specifically designed for 1, 2, or 3 persons, this is one of the best tandem kayaks. Despite the negative reviews it also received positive ones on Amazon and is definitely one of the best selling kayaks online. This 11-foot anger 62-pound fishing kayak can have 1 person sit on top but it has dual position hero seat for speed and stability. This includes 2 flush-mount rod holders and 4 integrated gear tracks perfect for customized rigging. It also has a foot-controlled rudder system that can save your energy during long paddles, on windy days, and when facing strong currents. This Vibe Kayaks Sea Ghost 110 has a fishfinder transducer port with mounting points and also a protective lid. The multiple storage areas are awesome. It has a large center console, a 20” front oval hatch, a rear hatch, and a large bungee rear tank well which is why it is considered as one of the best fishing kayak under $1000. The Sea Ghost 110 is one of the best kayaks from Vibe. The company is very well known when it comes to fishing and recreational kayaks and this has all the features that every kayak enthusiast is looking for. The quality is impressive at a very reasonable price. Definitely one of the must-haves in the market. This 12-foot recreational kayak can accommodate 1, 2, or 2 + 1 child as long as the total weight is about 375-425 lbs max. This is not only a recreational kayak, but it is also one of the best fishing kayak under $1000 that is perfect for a couple and a child. It has a three sitting position for a tandem with a child, a bow, and stern for a tandem, and also a middle if you want to paddle solo. It comes with 2 comfort plus seats with three molded-in seat wells, complete with gear straps, molded-in handles, and also a skid plate. The design of the hull and deck will allow you to easily stack multiple hulls for an easy on-dock storage. This kayak is very comfortable no matter what your leg length is. The patented overlapping foot wells will allow you for a center seated paddler with comfortable foot bracing. This kayak can be easily transported because of its very lightweight at 57 lbs only, and also its side-carry handles. The Ocean Kayak Malibu is one of the most popular compact tandem sit-on-top kayak. It is known to be very stable and versatile perfect for solo or tandem paddling. This is considered as the “go to” kayak of many people who loves to spend their free time paddling with family and friends. If you are looking for a kayak for multiple purposes, this is the best for you. The Sea Ghost 130 is one of the best fishing kayak under $1000 from Vibe. This is a 1-person sit-on-top kayak at 13-feet and 74 lbs. This has a dual-position hero seat that is perfect for speed and stability. This kayak includes 2 flush-mount rod holders and 4 integrated gear tracks for a customized rigging experience. This kayak has the ability to stand strong winds and currents because the company made sure that it has a toe-control rudder system. This will save your energy during long paddles, during windy days, and during strong currents. The kayak’s storage options are also impressive. It has a large center console, a 20” front hatch, and also a rear hatch, and a large rear tank well. If you are an adventure-seeker, this is the best fishing kayak for you. Vibe never failed to impress its customers with high-quality kayaks both for recreational and fishing purposes. With its amazing features and positive reviews from customers all over the world, this Sea Ghost 130 is definitely worth buying. This BKC UH-RA220 Riptide is a pride of the Brooklyn Kayak Company. It has the most amazing features compared to the other fishing kayaks in the market. It has a foot pedal-operated rudder that can help you control the kayak in any water condition without the need to paddle steer. It comes with a 2 flush mount rod holders that can keep your fishing poles in place without getting in the way as you paddle. It will also keep the lines in the water for trolling or still-fishing. This kayak has a stable platform that can let you stand up for long casts without falling overboard. Unlike other kayaks, the BKC UH-RA220 has waterproof storage. The company made sure that this will be one of the best fishing kayak with a watertight storage space and also a large cargo area. This will let you bring supplies for multiple day adventures. To secure your paddle parks, BKC UH-RA220 makes sure to secure your paddle to the hull using a bungee paddle rests when you are fishing or while you are taking a break. The Brooklyn Kayak Company BKC UH-RA220 has everything that you need in an angler. All of its features are specifically designed to provide the best aquatic adventure experience. The storage areas are impressive perfect to store your phone, keys, wallet, and even your lunch! This kayak can support a single adult with plenty of gears. When you purchase BKC UH-RA220, you are assured of a 5-year warranty courtesy of the Brooklyn Kayak Company. When it comes to choosing the best kayak for your next journey to the waters, it is important that you know what you are looking for. There are plenty of fishing kayaks to choose from, but you need to know how to pick out the best among your choices. There are certain factors that you need to consider in order for you to get the most out of the money that you are willing to spend. If this is going to be your first kayak, you have to arm yourself with the knowledge about the different kayaks and its features. Learn what are the things that you need to take notice of before you make your decision. Contrary to what others believe, a kayak is very easy to paddle and you don’t need high levels of experience in order to face mild waves or whitewater. They are mostly easy to handle and quite stable after you gain a little experience. There are so many kayak models in the market because there are also different destinations that you can go with your kayak. This means that when you are purchasing a kayak, you should be able to identify your needs first. Whether you want a racing kayak, if you want to tackle rapids, tour the wilderness, or maybe you just want to spend time fishing? These are very important to consider for you to know the type of kayak that you will purchase which will be the next step. As mentioned above, there are so many different types of kayaks for you. When choosing a kayak, remember that there are four general categories to choose from: recreational, touring, whitewater, and downriver. Recreational Kayaks. These are all-around boats that are specifically designed for mild river trips or for casual use on bays and ponds. These kayaks are usually wider and shorter compared to the other categories. Because of this, they are easier to maneuver especially when turning but would be difficult if you are traveling on a straight line. Touring Kayaks. These kayaks are often called “sea kayaks” but they are not only restricted to the ocean. If you are looking into paddling for extended wilderness trips, this is the best kayaks for you. These kayaks are longer but very stable and have a good carrying capacity. They track well but you will have a hard time turning them compared to shorter boats. Some touring kayaks are best for day touring where they have lesser storage areas but are generally lighter for better maneuverability. Whitewater Kayaks. If you are looking for a kayak that has impressive maneuverability, the whitewater kayaks are your best choice. This is perfect when you are facing strong and hard to negotiate rapids. They are generally shorter with rounded bottoms or flat planing hulls. These usually have upturned ends to help you deal with the waves easily. However, these kayaks are not recommended for touring because many find it hard to paddle in a straight line. Downriver Kayaks. These are also called “specialty boats” that are specifically designed to travel quickly through the water. These are the type of kayaks that are commonly used for racing. They are very long and narrow which makes them tippy. You need to have experience when you want to use downriver kayaks. These are not recommended for beginners. These kayaks may track efficiently because of their straight keel, but they are also difficult to turn. If the mentioned kayaks are not suitable for you, here are some of the alternatives that you can consider. This is perfect if you have a tight space or if you are focusing on fishing or just go kayaking with your partner. Folding Kayaks. This is perfect for small storage spaces in the apartment. It is also the best choice if you plan to travel or hike on your next trip. It is not rugged but has comparable handling and storing to other touring boats. Inflatable Kayaks. This is also a space-saver. Don’t underestimate this new alternative kayak because it is proven to be sturdy and versatile. These are recommended for recreational paddling where you should stay close to shore. Sit-on-Top Fishing Kayaks. These are compact kayaks and are usually fully equipped with rod holders and other features. This is a perfect choice if you want to free your hands while you cast and reel. Tandem Kayaks. There’s no more need to have 2 kayaks for you and your partner. You can now share a boat with this tandem kayak. These are usually more stable compared to its single counterparts. This is also perfect if you want to bring your kids or a pet along with you. When it comes to kayak dimensions, there are certain reasons for choosing longer kayaks or maybe a shorter one. This will still come down to its capabilities and how you intend to use it. So let us go ahead and take a look the difference between the longer and shorter kayaks. Longer kayaks have quite a number of advantages. They are easier to paddle, they are more stable, and can carry heavier loads without risking the performance. These can also track better and move faster, and can even glide farther with every single stroke compared to the shorter boats. This makes them more efficient which requires less effort. Shorter kayaks are lighter and less expensive. They are proven to be less cumbersome and very easy to transport because of their size. Some can even fit the back of their SUVs! When it comes to turns, shorter kayaks can turn easier and faster. If you are padding narrow streams, this is the best option for you. These kayaks are also perfect for smaller individuals or for children. The width of a kayak plays a very important role when talking about boat handling capabilities. Width is for stability. However, some would sacrifice the handling for the extra width. Narrow kayaks will not work that well on strong currents. When the boat has an additional width, it adds to its carrying capacity. But remember that the wider the kayak is, the harder it is to paddle because the hull has to push aside more water in order for it to move forward. Why Should HULLS Be Considered? The kayak design principles are very simple. When the hulls have flat bottoms, great flare, and if they have hard chines with sharp and nearly right-angled edges where the bottom and the sides meet, they have better stability. When your kayak has round hulls, lesser flare and soft chines where you can see a gradual curve where the bottom meets the sides, they have less stability but are definitely easier for you to roll in case you tip over. When you choose a long and skinny kayak that is a bow-shaped like a narrow V, these are built to be fast because the bow will slice through the water and will not pile it up in front of the boat. But if you choose a kayak that is broad in the beam with a full forward and aft, then this is a freighter and not a racer. This may be the option if you want to carry big loads as you ride the waves, but this cannot move quickly. Symmetrical Kayaks have the same shape on its front half and the back half while the asymmetrical does not have the same shape. Symmetry is very important because it does not only affect the kayak’s efficiency while it glides through the water, but it also affects its ability to turn. Symmetrical kayaks perform better when it comes to quick maneuvering. It can also easily negotiate small streams and even whitewater. Asymmetrical Kayak designs will lengthen and streamline the bow making it more efficient and faster as it moves through the water. The directional control is increased while its ability to turn is decreased. There are two types of asymmetrical kayaks to choose from: the Fishform and the Swede Form. Fishform. They have more volume ahead of the midpoint. Swede Form. They have more volume aft of the midpoint. This is the upturn of the kayak’s hull from one of its end to the other when you are viewing it from its side. When the kayak has a good rocker pivot can move easily because their ends are sitting higher in the water. This means that they will offer less resistance to waves. The downside of this is that it will not track well. The kayaks with a smaller rocker, on the other hand, can track better because they are able to resist the turning force of strong waves, current, the wind, and also inefficient paddling strokes. This will not make the kayak turn easily when the paddler will apply a proper turning stroke. Flat bottomed kayaks are stable at first. But kayaks with rounded hulls might be initially less stable at first, but they have the best secondary stability once the boat is leaned. When the kayak has a more pronounced V-shape on its bottom, the boat will have better directional control. Whitewater boats usually have flat planing hulls while the touring kayaks will have more rounded bottoms which are more preferred by kayak buyers. The chines are the transition that you see between the bottom of the kayak and its sides. A “hard chine” is a sharp, almost right-angled transition while the “soft chine” is the smoother and more rounded transition. Flare is the angle of a kayak’s side outward right from the hull. When the kayak has flared sides, they have greater stability but will be more difficult to maneuver. “Volume” is the most common term that you will hear from kayakers. You might think that this is a complicated code but in reality, Volume is the amount of space inside the boat which is commonly expressed in gallons or liters. Most kayakers would prefer to wear light clothing like simple shorts and t-shirts or even bathing suits. Just make sure that you wear what you are most comfortable in. Paddling through calm waters does not need for you to have experience. You just need to learn how to paddle properly and know about the safety precautions before you start paddling. But if you want to brave the strong waves and winds, you need to have the experience to make sure that you are safe. Is Kayaking Safe For My Children? Like any other sport, Kayaking can be dangerous if you don’t know what you are doing. If you are a beginner, settle for calmer waters. If you want to bring your kids with you, just make sure that you have the experience and the knowledge with kayaking to ensure your kids’ safety. All you need is your kayak, a paddle with a spare, your personal flotation device, and a bilge pump. You should also bring with you a spray skirt for cold weather, dry bag if you don’t have a waterproof compartment, headlamp with extra batteries, and a signaling whistle for emergency purposes. Yes. Kayaks can tip over but most kayak models nowadays are stable and tipping over rarely happens. For beginners, make sure that you wear a life jacket to ensure your safety. Can I Kayak Even If I Don’t Know How To Swim? You don’t really need to swim while kayaking, but it is better if you can do that. Individuals who do not know how to swim has the tendency to panic once they are in the water. Remember that you will be floating above the water so you have to feel comfortable with it. Paddling is a type of activity that may involve a bit of exercise. Being fit is not a requirement but it is an advantage. If you weigh lesser, you avoid any chance of going over the weight limit of your kayak especially if you go tandem. You will also fit perfectly on sit-in kayaks. But nevertheless, whatever your weight, or height, or leg length is, kayaks are now built to cater different kinds of kayaker with different needs. Sit-on-Top Kayaks, Are They More Stable? Remember that the narrower the kayak, the faster it can glide through the water. The wider the kayak is, the more stable it is. Sit-on-Top kayaks are mostly recreational kayaks because they are wider and more stable compared to sit-ins. The most obvious difference between canoeing and kayaking is the equipment that you use. Canoes are open-top boats commonly designed for two or more people. Kayaks, on the other hand, are closed-top boats that are usually for a single seater. They sit lower in the water compared to the canoes and they have higher sides. Kayaking is a fun and exciting activity that you can do alone, with friends, or with your family. With the latest models of the best fishing kayaks under 1000, you can now enjoy the waters as you glide swiftly using the best kayak of your choice while appreciating the view. It is important that you know how to choose the best kayaks in the market these days. The guide and the product reviews mentioned above can help you make that final decision. So choose wisely and enjoy your next adventure!